Acclaimed Slovenian classical guitarist Karmen Stendler has appeared in a wide range of venues, from Ljubljana’s Philharmonic Hall to Artegna Castle in Italy, Sundin Music Hall in Minnesota (US), Konzerthaus Klagenfurt in Austria and the Hall of the Arts Academy in Berlin. Other performances include appearances at international guitar and chamber music festivals such as Echos Festival in Italy and Slovenia, José Tomás Guitar Festival in Spain, Andrés Segovia Guitar Festival in Pescara, Italy, Bamberg Guitar Days in Germany and Postojna Guitar Festival in Slovenia, to name a few. After studying at renowned music institutions in Slovenia, Germany and Spain, Karmen is currently completing a postgraduate solo artist diploma (Konzertexamen) at the University of Music »Franz Liszt« in Weimar under renowned German professor Thomas Müller-Pering. 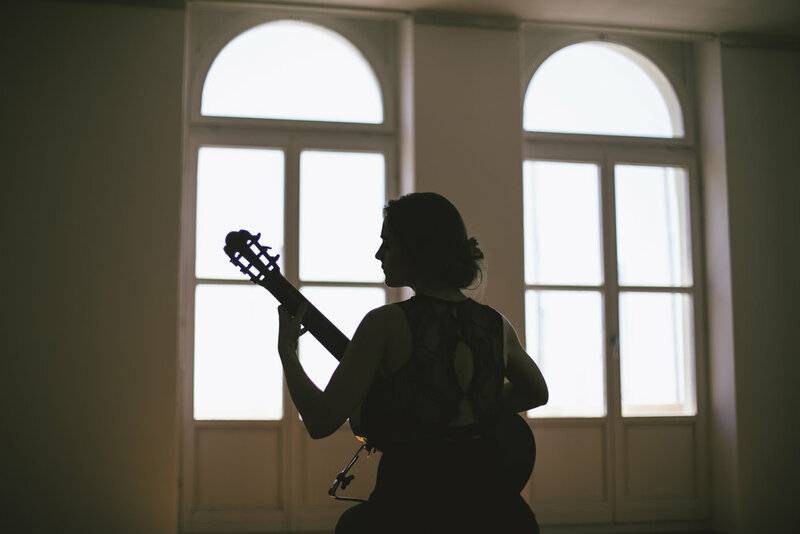 She holds two master’s degrees in classical guitar performance, one from the above mentioned University, and the second one from the Academy of Music in Ljubljana, where she studied with the dean of the Academy, professor Andrej Grafenauer. She also completed her bachelor’s degree in Ljubljana with the highest mark. She is a multiple prizewinner at national as well as international competitions, which include Enrico Mercatali Guitar Competition in Gorizia (Italy), José Tomás Competition in Petrer (Spain), Andrés Segovia Competition in Pescara (Italy), International Guitar Competition Krško (Sloveni), and multiple national Slovenian competitions. In 2012, at the age of 20, she received a Prešeren Award from the Academy of Music in Ljubljana for her exceptional artistic achievements in the previous year. Karmen’s debut CD »First« was released in January 2016 and in 2019 the debut CD of the Weimar Guitar Quartet came out with stellar reviews. Since 2009 she has also regularly been recording for the Slovenian Radio and Television and the same institution broadcast many of her concerts in Slovenia including the Roland Dyens’s »Concerto en si« that she played as a soloist in 2011. Since 2013 she has also regularly been recording at the Baros Records Studio in Slovenia. Besides solo projects she is also an active chamber musician, notably playing with the Weimar Guitar Quartet, but also in guitar duo, duo with violin, duo with accordion and trio with violin and accordion. She is also an advocate of Slovenian and Balkan music, which she often includes in her programs. Karmen regularly gives lectures, workshops and masterclasses at renowned institutions such as the University of Minnesota School of Music, Conservatory of Music and Ballet Ljubljana and others. Throughout her studies she has been generously supported by several institutions, which awarded her scholarships, such as Germany’s DAAD, Alfred Toepfer Stiftung, Neue Liszt Stiftung, the Slovenian Ministry of Culture and the City of Ljubljana. Over the last 10 years, she has had the privilege to work in masterclasses with distinguished professors such as Eliot Fisk, Pavel Steidl, Zoran Dukić, Marcin Dylla, Paolo Pegoraro, Ricardo Gallén, Carlo Marchione, Aniello Desiderio, Hubert Käppel, Joaquín Clerch, Lorenzo Micheli, Judicäel Perroy, Margarita Escarpa, Alexander Swete, Christian Gruber, Peter Maklar, Sante Tursi, Thomas Offermann, Jens Wagner, Petr Saidl, etc. In her free time she likes to read, do yoga and has a black belt in karate. She also loves to learn foreign languages, and currently she is fluent in Slovenian, English, German, Spanish and Serbian, while also learning Italian and French.